Yes, I’m late getting this Paper Pumpkin done but I just love this kit and if you aren’t a subscriber…do so now so you don’t miss the upcoming kits! Here’s the official video from Stampin’ Up for the April Paper Pumpkin. Isn’t it just darling–it’s called You Are My Anchor. I made this kit exactly as shown and here is a photo of the adorable boxes with the cards nestled inside. I love it and I’m happy that I purchase two kits per month so that I can play a bit. I put three cards in each of the four boxes, there’s 20 cards and envelopes in the kit so I used the extra to make alternate gift boxes. For the extra projects that will house one card plus a gift card I used the Mini Pizza Boxes. These are food safe on the inside and you can stamp the outside. I wanted extra gift boxes for graduates and these are perfect for the boys. 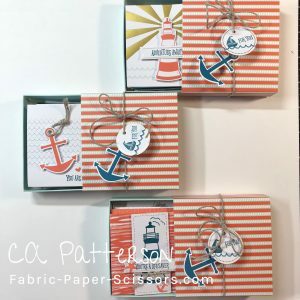 I decorated the sides with the stamps and ink from the You Are My Anchor April 2018 Paper Pumpkin kit. I stamped the water using Tranquil Tide and the boats in Calypso Coral. I put a sentiment on the front of each box and put a piece of tissue paper (cut to size) inside. 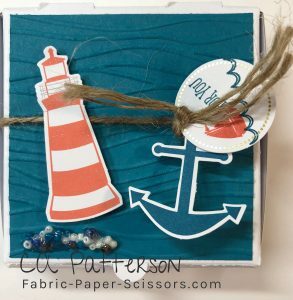 I cut Tranquil Tide and Calypso Coral Cardstock 3-1/4″ squares, ran them through the Big Shot using the Seaside Embossing Folder. I adhered the 3-1/4″ square to the top of the Pizza Box using Multipurpose Liquid Glue–love this stuff! I punched small holes on the flaps of the sides near the top and ran a piece of twine through the back and tied it in a knot on the top. Added an anchor and a tag and tied another knot. There’s lots of goodies left over from the kit to use on other projects. PP is very generous. In the 2018-19 Annual Catalog, there’s a suite called Tranquil Textures on page 154 & 155. I used the Tranquil Textures Sprinkles on the Mini Pizza Box tops pictured below. 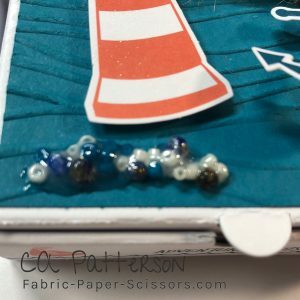 I ran a strip or blog of the Multipurpose Liquid glue and then smushed the sprinkles into the glue. Do this over a coffee filter to catch the pieces that don’t stick. After everything was assembled, I used the Fine Tip Glue Pen and added a lot to the top of the sprinkles to add dimension and keep them in place. Put them aside to dry completely. I love the look…what do you think? What next? 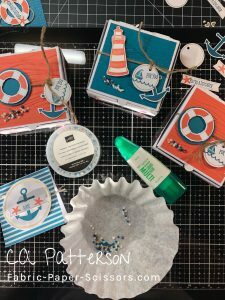 Subscribe to Paper Pumpkin because there’s so many projects that you can do with each box…think out of the box and get even more. For only $19.99 a month…how can you go wrong! Watch this quick video below and you can sign up through me and click here for my personalized link. Sign up for one month or three and see how much fun having a surprise delivered to your mail box monthly. Paper Pumpkin is also great for a summer project for your kids! 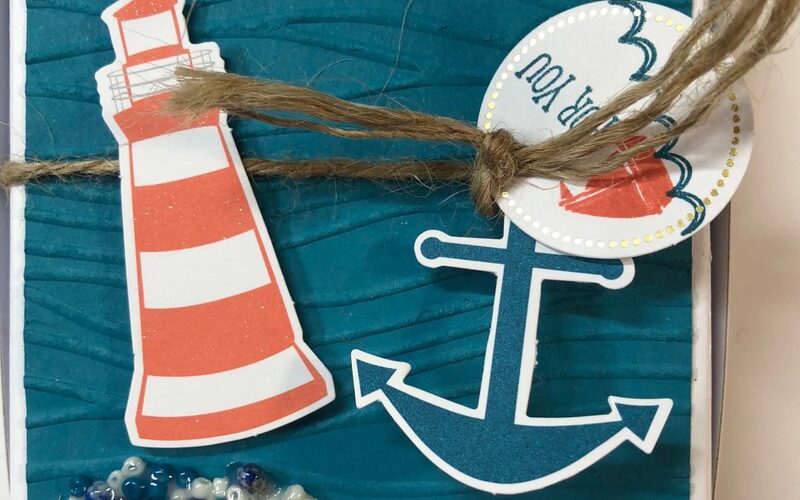 Every month, a fun crafty item arrives for them to create. Try it, you’ll love it! I hope you enjoyed this little project. If you don’t have this Paper Pumpkin Kit, use a stamp set that you do have, get a package of the Pizza Boxes–create 3 x 3″ cards* and buy some little envelopes to match or make your own with the envelope punch board. *you can make six little cards from a 12 x 12 sheet of cardstock, cut at 3″, then cut that piece at 6″, score at 3″ and you’ve got adorable little cards! 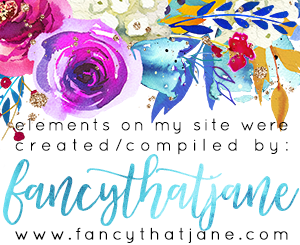 If you don’t have a Demonstrator, I would LOVE to be yours!